The fate and risk assessment of silver nanoparticles (Ag NPs) is an important environmental health issue. The toxic effects, mechanisms, and modes of action of Ag NPs on aquatic organisms have been extensively determined in the laboratory. However, knowledge gaps and discrepancies exist between laboratory studies and realistic environmental research; such inconsistencies hinder the development of health and safety regulations. 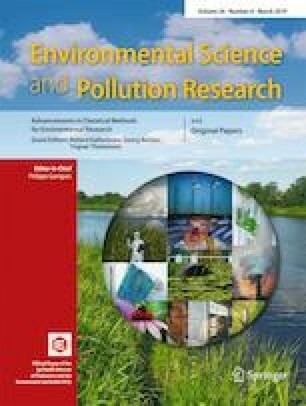 To bridge these gaps, this review summarizes how environmental conditions and the physicochemical properties of Ag NPs affect the inconsistent findings between laboratory studies and realistic environmental research. Moreover, this paper systematically reviews different toxic effects of Ag NPs in a realistic environment and compares these effects with those in the laboratory, which is helpful for assessing the environmental fate and risk of Ag NPs. The hazardous effects of Ag NPs on the whole aquatic ecosystem with low concentrations (μg L−1) and long-term periods (months to years) are detailed. Furthermore, two perspectives of future toxicity studies of Ag NPs in realistic freshwater environments are emphasized. The online version of this article ( https://doi.org/10.1007/s11356-019-04150-0) contains supplementary material, which is available to authorized users. We acknowledge financial support from the Joint Funds of the National Natural Science Foundation of China (No. U1804109), the Scientific Research and Service Platform Fund of Henan Province (No. 2016151), the scientific and technological innovation team of water ecological security for the Water Source Region of Mid-line of the South-to-North Diversion Project of Henan Province (No. 17454), the Foundation of Henan educational committee (No. 19A330003), and the Foundation of Nanyang Normal University (No. 18023). We greatly thank the anonymous reviewers for their helpful comments.